We sail by the island of Makronissos – it used to be the island of “Helen of Troy”, but during the Civil war and the Dictatorship was turned into a place of exile. We stop for a swim at the bay of Polles, the ancient capital of the island of Kea, not inhabited anymore. Later we moor at the bay of Loutra in the island of Kythnos. The small fishermen’s village of Loutra (Baths) has an interesting cuisine and a natural spa (thermal waters) that runs all the way to the sandy beach, very close to the port. If you feel like it, you can put on your swimming suits and lie in the small man-made pools at the end of the thermal creek. After breakfast we set sail for the bay of Aghios Stephanos for a swim. We can stay there for some time and later make a longer passage to the port of Kamares on Sifnos. From there is worth to take the bus or a taxi and visit the Chora and the small fortified village of Kastro. 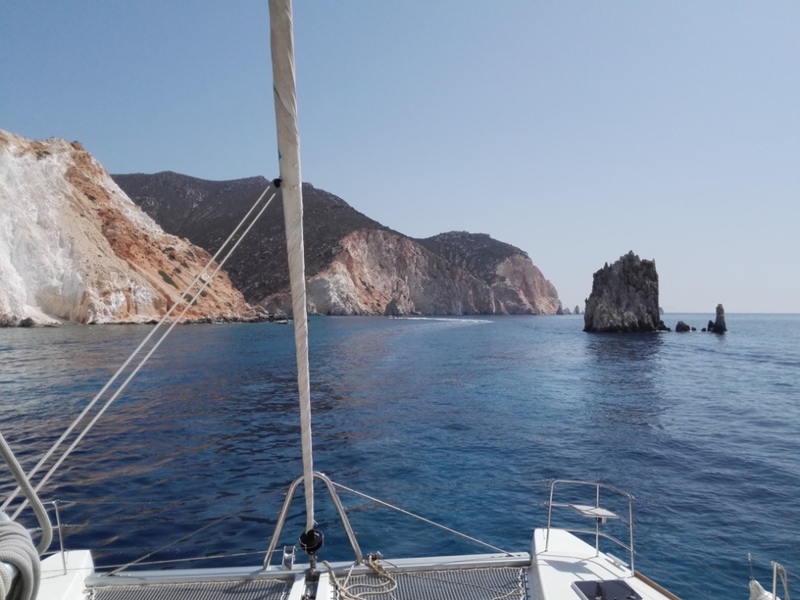 We cruise along the coast of Sifnos, swim at Vathi protected bay and then head for Milos. If weather allows we stop at the white-washed rocks of Sarakiniko on the north bay of Milos and finish the day at the main port of Adhamas. Milos is famous for it's beaches and especially for the protected bay of Kleftiko at the SW corner of the island. We leave early in the morning to arrive there before the daytrippers and when they show up we continue to the west beaches. We end the day at the port of Psathi on the island of Kimolos. The village and the small port are very picturesque and definitely worth the visit. We leave Psathi and head for a first swim at the uninhabited island of Polyaigos. The beaches there are among the best in the Cyclades. We sail to the beach of Kalo Ambeli on Serifos and stop in the port of Livadhia for the night. In the evening we visit the Chora on the hill, overlooking the port.